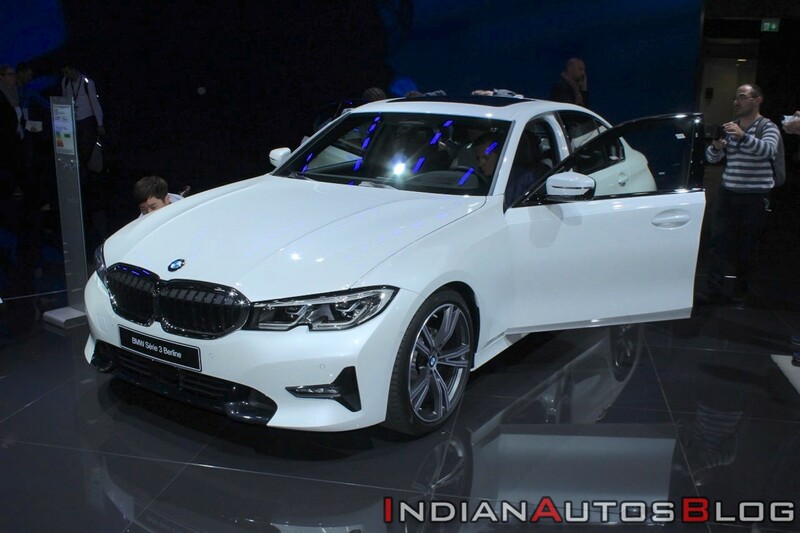 IAB reader Snatak Mundade has spotted the 2019 BMW 3 Series on test in Pune. The all-new sports sedan is scheduled to reach showrooms in the middle of the year (May-August). Sleeker, sportier and bigger than its predecessor, the seventh generation BMW 3 Series has further raised the bar in the global premium midsize class. Not just that, it’s up to 55 kg lighter than the sixth generation model. Like the exterior, the interior sees evolutionary changes, and even though being quite familiar, it’s a whole lot classier and more technologically superior. Measuring 4,709 mm in length, 1,827 mm in width and 1,441 mm in height, the all-new BMW 3 Series is 76 mm longer, 16 mm wider and 1 mm taller than its predecessor. The wheelbase, at 2,851 mm, has increased by 41 mm. Shoulder room in the front has increased notably, while passengers in the rear benefit from more legroom now. All occupants enjoy more headroom. Comfort in the middle seat in the rear has also improved. On the outside, the 2019 BMW 3 Series features Adaptive LED headlights with BMW Laserlight, slim, 19-inch alloy wheel, slim, L-shaped LED rear lights and twin-pipe exhaust system. Interior highlights include glass roof with 100 mm longer transparent surface, BMW Operating System 7.0-based BMW Live Cockpit Professional with 12.3-inch fully digital instrument cluster, 10.25-inch Control Display and BMW Intelligent Personal Assistant that responds to “Hey BMW” - a first for a BMW, and BMW Head-Up Display with 70% larger projection area. Needless to say, not all of these features will be included in the Indian specification. BMW will offer the all-new 3 Series in India in the 330i and 320d model variants at launch. The 330i packs a 2.0-litre petrol engine that produces 258 PS and 400 Nm. The 320d employs the 2.0-litre diesel engine good for 190 PS and 400 Nm. An 8-speed automatic transmission will channel power to the rear wheels. Production of the 2019 BMW 3 Series at the Munich plant (Germany) has commenced. Production of the 2019 BMW 3 Series at the Munich plant (Germany) has commenced. India will get it in CKD kits imported from this plant right from the launch, with assembly taking place in Chennai. Expect prices to start at over INR 40 lakh (ex-showroom).